A collective gasp greeted the shoal of brightly-coloured fish gliding into view. Peering through the glass-bottomed boat, the translucent emerald green water afforded a fascinating glimpse into the mysterious underwater world. We viewed shipwrecks and were treated to a majestic display from schools of `dolphin swimming nearby before Neptunus, a yellow boat aptly named after the Roman god of water and sea, returned to the jetty at Santa Maria on the island of Sal. It was a wonderful welcome to Cape Verde, a cluster of ten islands lying 300 miles off the west African coast. As a warm breeze tickled my face upon disembarking, it was easy to see why this archipelago is making headlines as an emerging holiday destination. 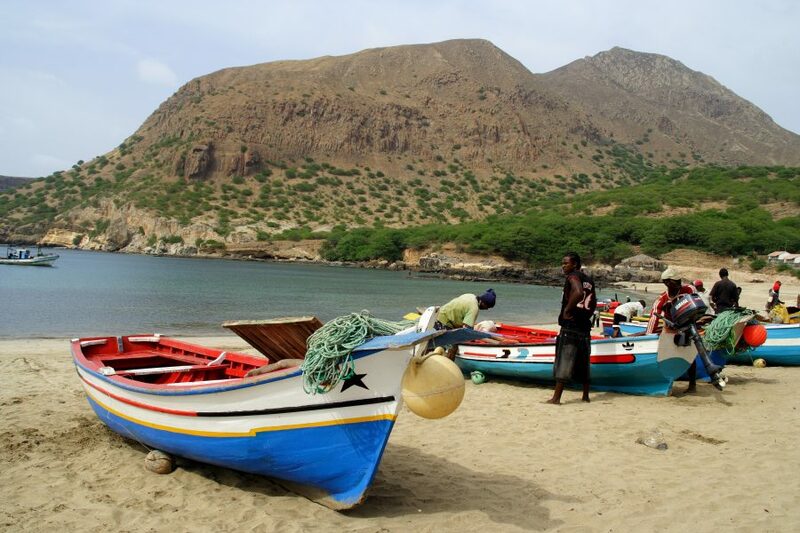 All-year sunshine and temperatures rarely dipping below 20 degrees are among Cape Verde’s attractions. And after enduring one of the wettest and gloomiest years on record back home, they were very welcome as I delighted in the warm afternoon sun, shining brilliantly from a cloudless sky. While some visitors enjoy relaxing on the endless white sandy beaches of Sal or indulging in a multitude of water sports, including kite-surfing and scuba-diving, it’s a shame to visit this part of the world without partaking in a little island-hopping. I took advantage of the network of internal flights and ferry services linking the islands and visited Santiago, the largest and most populated island. It’s also home to the capital, Praia, but its charms lie north. 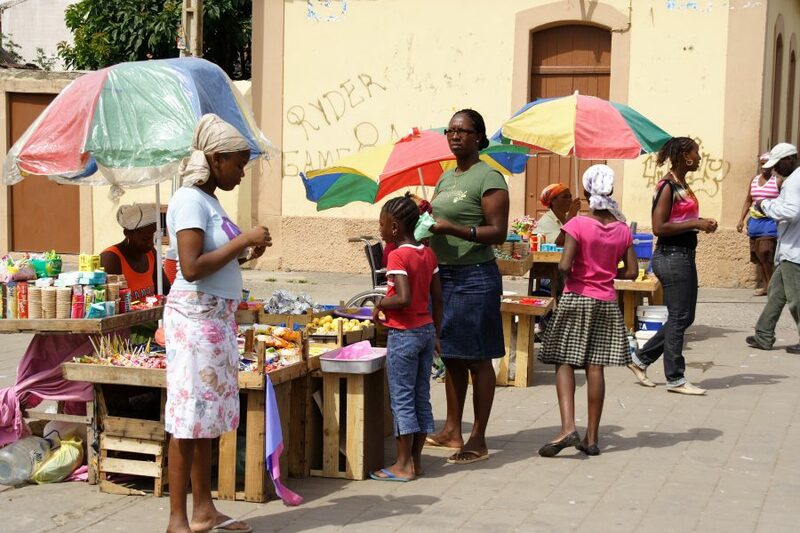 The most common mode of transport in Cape Verde is the aluger, which can be a minibus or simply a 4×4 pick-up truck with benches in the back. It’s a great way to experience the local way of life so long as you don’t mind erratic driving! Alternatively, hiring a car complete with driver is a pleasant way to explore at your own pace, especially as signposts are limited and road conditions variable. Banana and coconut fronds danced in the wind as we drove via the town of Assomada, where the local market was in full swing, to the northern town of Tarrafal. En route, photo opportunities abound. By the time I lunched at Baia Verde restaurant, overlooking a golden beach, neck ache had set in, thanks to all the twisting in the car while looking in every direction at the breathtaking scenery, including volcanic peaks stretching 5000 feet into the air and a patchwork of terraced fields covering steep hillsides. 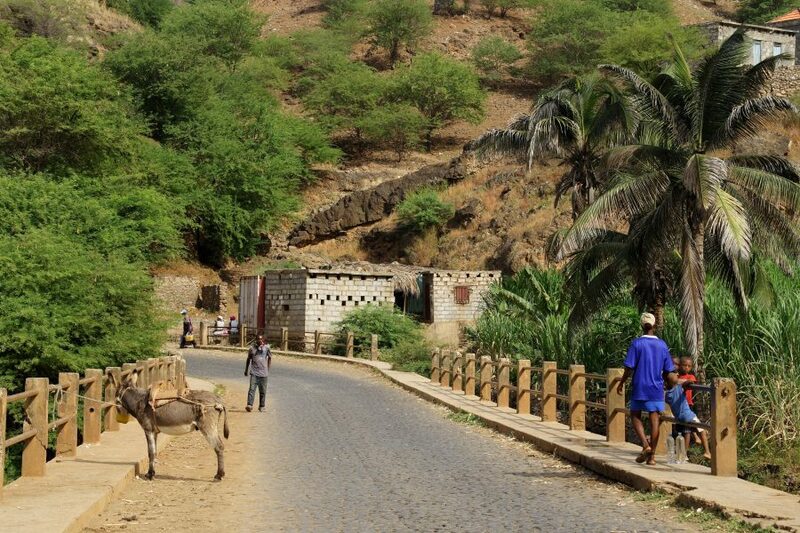 Another of Cape Verde’s selling points is its diversity with every island boasting a unique character and landscape. The contrast between Santiago and Sao Vicente, my next port of call, was startling. As we approached the airport, recently upgraded to accommodate international flights locals hope will arrive soon, the lush, rugged landscape of Santiago was replaced by an arid, barren terrain. Before heading to Mindelo, the archipelago’s cultural capital, I strolled along Sao Pedro Bay, where the Atlantic crashes onto a wide sweep of sand. Although currents make it unsafe for swimming, it’s a windsurfer’s haven. A stone’s throw from the airport, although seemingly a world away, Sao Pedro springs into life when garishly painted fishing boats bob into view, delivering their catch to the delight of children and adults alike. 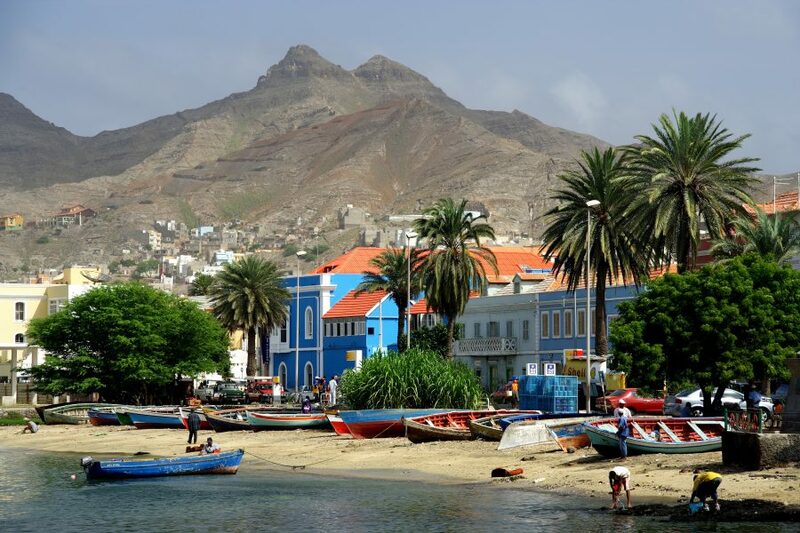 It was time to move on and I left the mountain-backed bay for the tree-lined streets of Mindelo, five miles away, admiring the brightly coloured colonial buildings, dating back to the 19th century when the British East India Company stocked coal from Cardiff on the island, supplying ships en route for the Americas. Before the century was out, Western Telegraph, responsible for laying an underwater cable for transatlantic communication, saw other Brits arrive on the island. The British legacy remains not just in the buildings but in a sports club, cricket club and golf course, which is still frequented by the island’s Tiger Woods despite being void of grass and extremely dusty and stony. 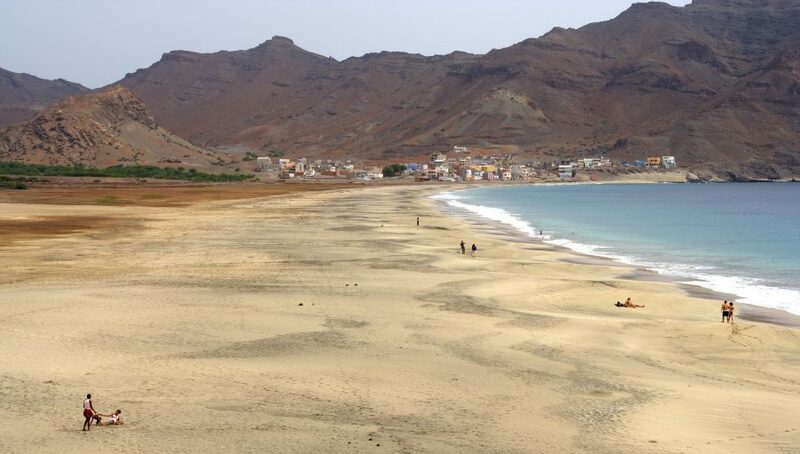 In fact, greenery of any kind is hard to find on Sao Vincente, but that doesn’t diminish its appeal and, again, it’s blessed with some smashing beaches, my favourite being at Salamansa, a tiny fishing village northeast of Mindelo. 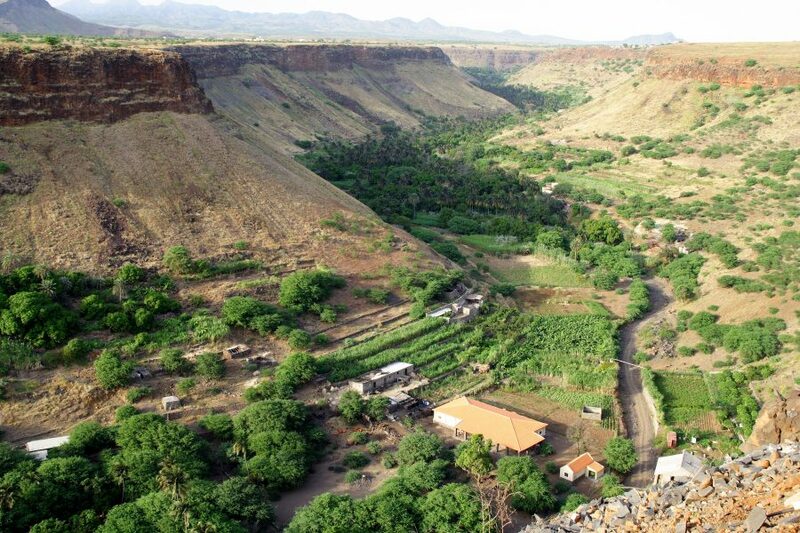 But one of the highlights of my stay here was hiring a car and taking the road which snakes its way to the top of Monte Verde, the highest point, affording panoramic views of the red rock landscape. 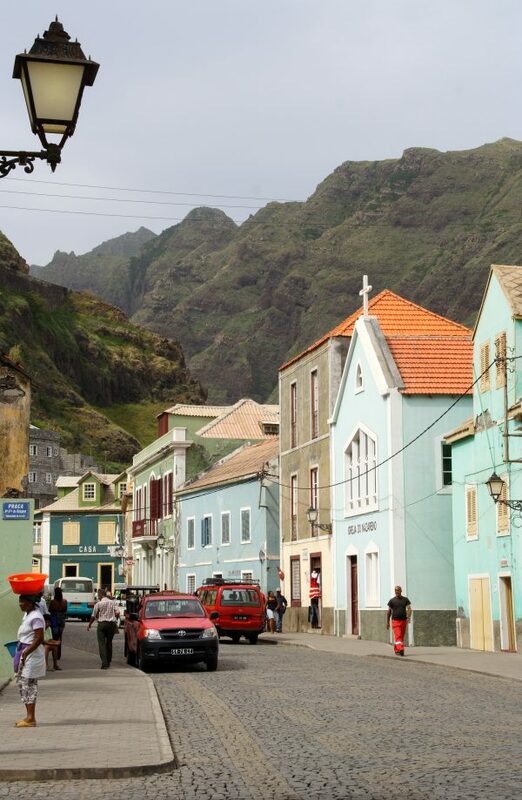 The scenery changes again on nearby Santo Antao, reached via an hour-long ferry crossing from Mindelo. The second largest island, it’s packed with mountains of all shapes and sizes, and the drive from the ferry point to the northern region is arguably one of the world’s finest. We left the featureless south behind and climbed high. On reaching the crest of the hill, we drove into another world full of towering peaks, deep valleys and a lushness even more impressive than Santiago’s. Sheer spikes of volcanic rock and myriad ravines sent my camera into overload as we bounced along the 22-mile cobbled road ten years in the making – and by hand, too. All around, trails made by locals, many of whom still traipse miles to collect water, are also walked these days by enthusiastic hikers. I didn’t don my walking boots because I was heading for Ponta do Sol, the island’s main town built around its harbour, and Senhor Ildo Benros Silva’s distillery, where Cape Verdeans favourite tipple, grogue, is made. Distilled from sugar cane, the spirit has a staggeringly high alcoholic content and would soon leave your head spinning. A sip was enough for me, before finding a restaurant overlooking the ocean – and there are plenty to choose from, even on this, the least developed island in terms of tourism. All too soon my holiday drew to a close. I’d seen much in a short space of time and the experience had whetted my appetite for more. Although it’s nearly six hours’ flying time from the UK, the rewards at the end of the journey make it worthwhile. 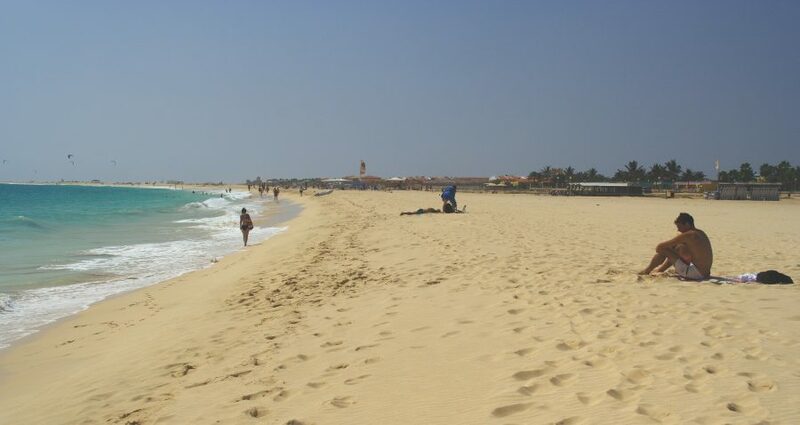 Cape Verde will satisfy most holiday wish-lists. Whether it’s mountain hiking, bodyboarding the ocean waves, enjoying the local culture or simply flopping out on white sandy beaches, you’ll find it here. I’d enjoyed my break but felt I’d only scratched the surface. With so much more to see I’ve decided my New Year’s resolution is to return to these sun-kissed islands – and I can’t wait. Unwind at the beginning or end of your holiday on Sal’s 5-mile long sandy beach, swimming in clear water among the myriad of fish. Dance to the sound of local musicians playing traditional music in Mindelo, the archipelago’s cultural hub on the island of Sao Vicente. Admire Mindelo’s mix of Portuguese and British architecture, originating from the island’s 19th link with our coal industry. Catch the ferry to Santo Antao, the second largest island and perhaps most spectacular with high mountains and stunning drives – a photographer’s dream. 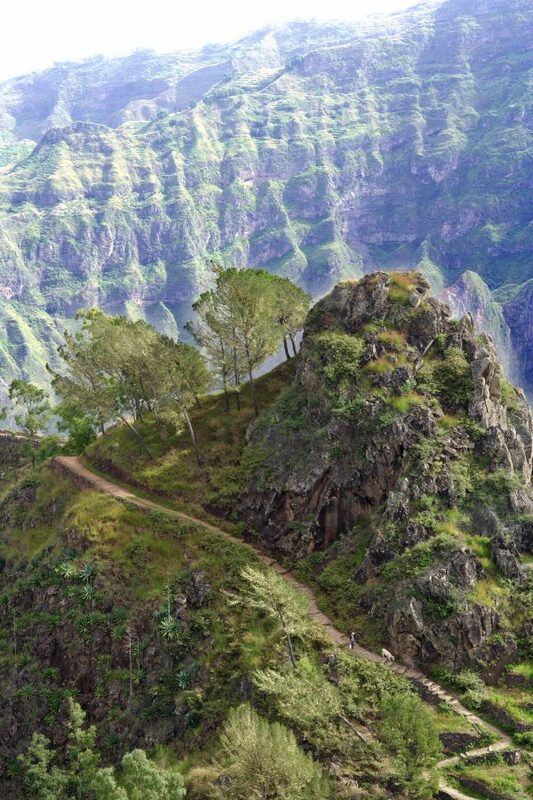 Stop to take in the marvellous vista afforded by Santo Antao’s Cova de Paul volcanic crater. Visit the capital, Praia, on the island of Santiago, before heading for the National Botanical Gardens, located in a fertile valley below towering mountains. Listen out for the Cape Verde Warbler, which is spotted in these parts. Before leaving Santiago, relax over lunch at the Baia Verde restaurant, commanding a fine beach view at Tarrafal, in the north of the island. Visit Fogo, an island dominated by an awesome, active volcano. Sip the local wine and buy a souvenir made from lava stone. Explore the Sahara-like dunes on Boavista, the island closest to the African coast. Sample grogue, a local drink distilled from sugar cane. But watch out, its high alcohol content means it packs a mighty punch!